Healthy Eating, to my knowledge had meant to AVOID Coconut, Ghee, Full Fat Diary, No to Mango, NO NO Banana, Avoid Rice and have Chapathi, use Canola Oil, etc,etc,etc. After my second kiddo, when i wanted to lose those XXXXXTRA pounds off me, i started to do, what i thought was good. One day while blog hopping i was going through afellow blogger and a good buddy Raji Eswar's Vegetarian Tastebuds Blog, where she mentioned about Sangeeta Khanna, another Food Blogger and also a Nutrition Consultant, there is much more to add to her name, but then it would be a very long post. Sangeeta Khanna, blogs @ Healthfood Desivideshi and she also plans personalized diet plans for you. After talking to Sangeeta, My perspective towards food and eating has changed totally. Now i never use the term Dieting,it is Healthy eating. You don't have to starve yourself to lose weight or be healthy. Just need to know what suits your body better and try to alter it according to it's needs. That's it, once you start doing this, there is no looking back. I m on my journey to Better health and Healthy Living with Sangeeta's help. 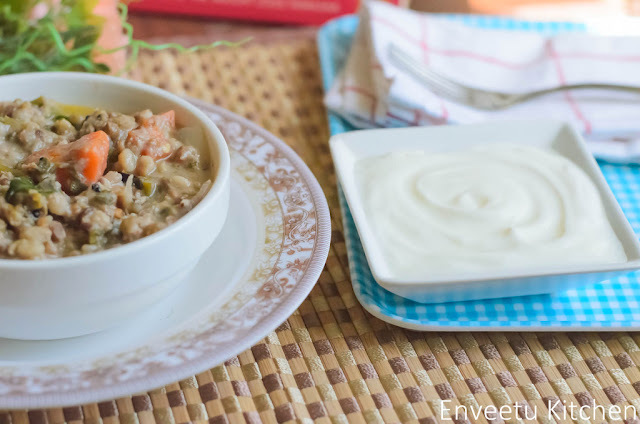 This is one such recipe which i follow as part of my eating plan from her blog. 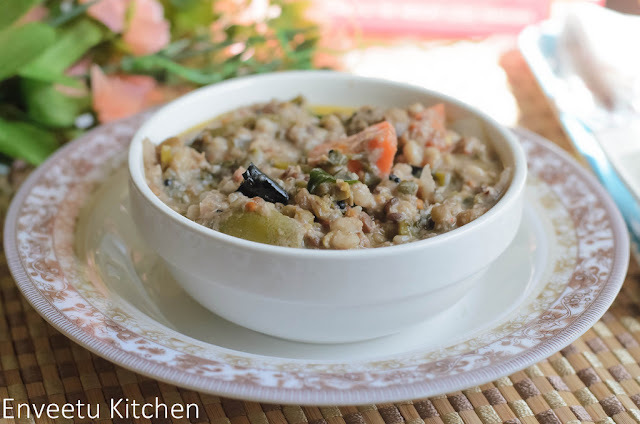 Simple and easy to make Khichdi with loads of fresh vegetables. Wash all the grains and soak them for 30 minutes. Wash the veggies well and Chop them into cubes. In a Pressure Cooker, Take the soaked grains, chopped veggies, add Slited Chilies, chopped garlic, ginger and coconut. Add 2-3 cups of water. The water should be a bit more than the veggie-grains mixture. Add Salt, Mix well. Close the Pressure cooker lid and Cook for 4-5 Whistles in a medium flame. Let the Pressure go down, open the lid. In a Small Sauce pan/Tadka pan, Heat oil given under "Tempering", splutter mustard seeds, add broken chilies, urad dal and almonds. 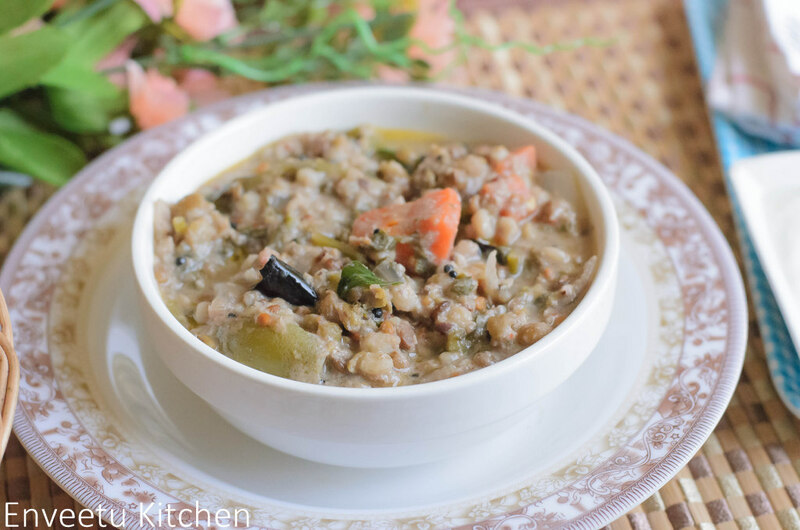 Let the dal brown a bit, add this sizzling tempering to the Khichdi. Serve it Hot with Simple Yogurt/Curd. The Khichdi tastes yum, as such withouth any accompanimet, since it has got all the spices needed and the veggies added, makes it so filling and yum. Sometimes i add some more water to the khichdi and have it as stew for Dinner. 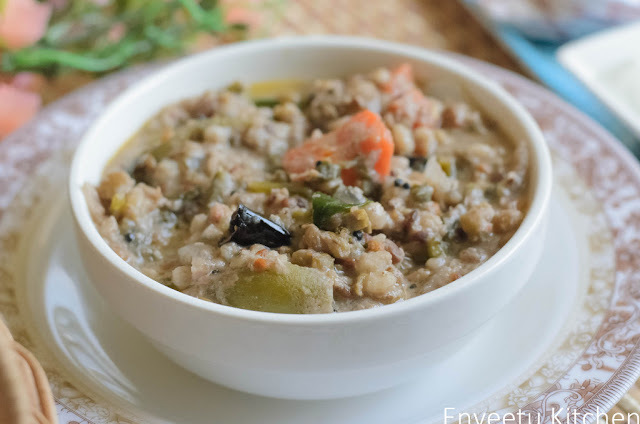 Sending this to Healthy Me, Healthy Us, happening @ Sizzling Tastebuds, Event by Priya of Mharo Rajasthan Recipes And also to Dish it Out - Lentils n Vegetables, happening @ Cooks Joy. Even i do share the same thought,no need to starve to lose weight. Healthy khichdi looks fabulous,filling,satisfying and nutritious. That's one healthy khichdi. Lovely clicks. Khichidi looks really tempting and delectable!! 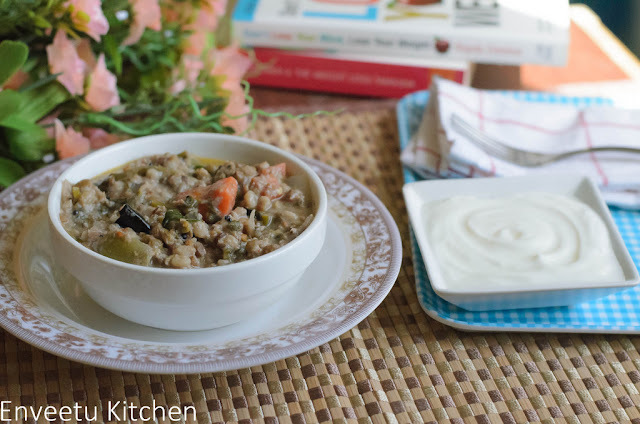 I tried idlis with multi grains this khichdi sounds very interesting. Healthy kichidi. Nice idea of using multigrains. Thx for linking.